A previous installment of Growth Path Accounting covered the Step Two question, "What are your information goals?" Before we go into an in-depth comparison of the methods, we're pausing to answer potential objections to this "GPS" accounting implementation strategy. Astute readers will have detected two potential flaws in the Growth Path System. 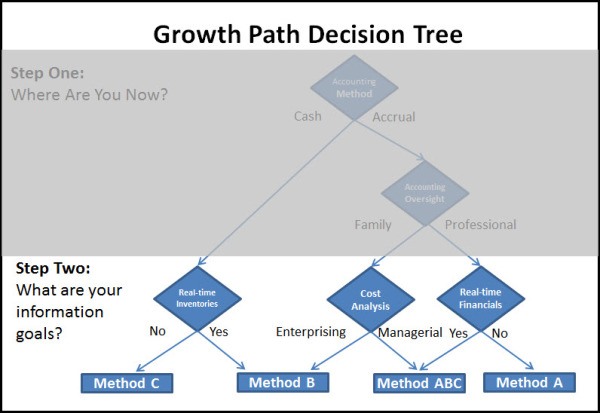 The first is that Growth Path Accounting does not attempt to "convert" anyone from cash to accrual or single entry to double entry (or vice versa). In fact, it's possible to go through the first phase of Growth Path Accounting without gaining any noticeable improvement over the financial information delivered by the current accounting system. The second potential complaint arises from the fact that Growth Path users are limited to four seemingly-rigid choices in starting systems: Methods A,B,C and ABC. To begin doing useful work on the computer as quickly as possible. To learn advanced accounting skills at home at your own pace. To provide for future expansion to integrated farm records. You cannot get off to a "fast start" computerizing a job that you have never done by hand. Too many farm accounting programs are now collecting "digital dust" because their owners bit off more than they could chew by selecting a program that could do everything but demanded more detail and precision than anyone on the farm could provide. Growth Path Accounting compromises in this area by immediately producing useful information, regardless of the user's background or the method chosen. Finally, the key to success in Growth Path Accounting is in the ability of the accounting software to freely climb to more advanced levelsas experience allows or needs dictate. Unfortunately, few programs have this capability. If properly designed, though, the four initial accounting systems are more than adequate starting points from which to reach the unique goals of most farm businesses. In the next issue, we'll begin a detailed overview and comparison of these accounting systems.